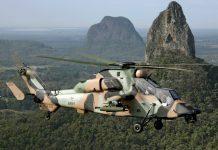 Home Print Articles 2017 Will the Sun set on Air Superiority? Japan possesses one of the most capable air forces in the Asia-Pacific alongside the People’s Republic of China (PRC) and the United States. Its force of around 370 fast jets is mostly comprised of up-to-date and effective fourth-generation types. The Japan Air Self Defence Force (JASDF) is focused on a core of 200 formidable McDonnell Douglas/Boeing F-15J/DJ Eagle fighters. Furthermore, its pilots are well trained and frequently conduct high-level training with the US Air Force and other allied air forces to keep their tactical edge. However, in the PRC’s People’s Liberation Army Air Force (PLAAF) and Navy (PLAN), Japan faces a formidable, and increasingly modern, threat in close proximity to its borders, including active territorial disputes, especially over the Senkaku/Diaoyu Islands in the East China Sea under Japan’s control with their sovereignty disputed by the PRC and the Republic of China. In the face of Chinese (and Russian) air force and air defence modernisation, Japan’s combat fleet is increasingly facing operational obsolescence and technological overmatch. For the JASDF which is limited in size by Japan’s constitutionally-limited defence budget and has, therefore, been reliant for many decades on technological advantage to adequately defend against a much more numerous PLAAF, the future presents serious challenges. 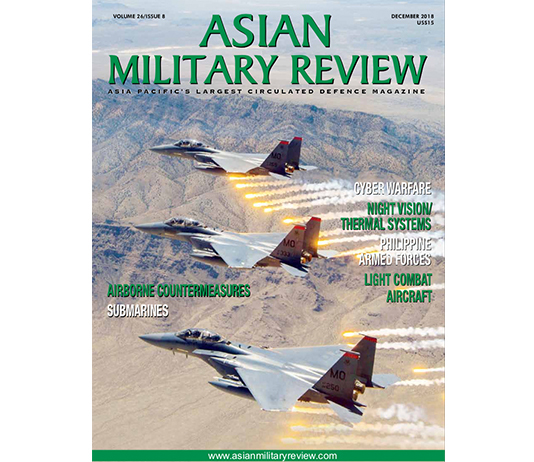 The USAF is also facing its own problems with force size, modernisation and pilot shortages relative to global commitments which is likely to contribute to a long term reduction in the longstanding American capability to establish air superiority over the PRC in the Asia-Pacific; a trend which only increases the requirement for a strong JASDF. In recent years, the JASDF has seen air defence sortie scramble rates increase greatly over those witnessed in the decade and a half following the end of the Cold War. 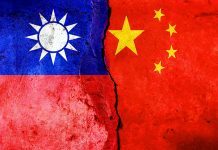 Both Russia and the PRC regularly probe Japan’s declared airspace over the Senkaku/Diaoyu and Kuril Islands, northeast of Japan and under Russian control, and launch strategic bomber, surveillance and maritime patrol aircraft sorties which skirt Japanese airspace. 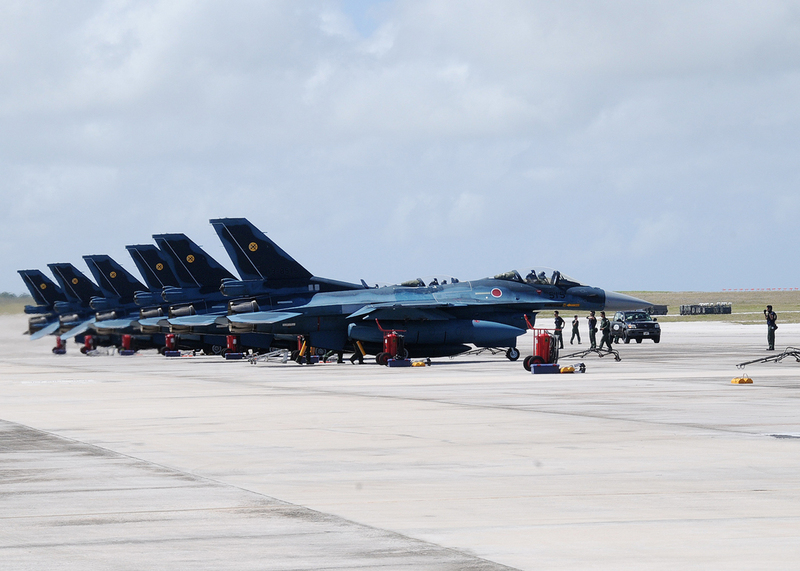 From around 300 or fewer scrambles per year up to 2012, scramble rates have steadily increased to 571 in 2015 and more than 1100 in 2016 which is the highest annual total in JASDF history. This level of air defence activity is well above the defence planning assumptions in place when the JASDF procured its current fighter fleet and places a heavy burden on squadron readiness and fleet airframe fatigue management, especially given the relatively small number of F-15Js on whom the majority of this tasking falls. If such rates continue in the medium to long term, this will force an earlier replacement or at least total overhaul of the JSADF F-15J fleet earlier than envisaged. In the strike and anti-shipping roles, the JASDF and air component of the Japanese Maritime Self-Defence Forces (JMSDF) are faced with severe challenges in maintaining credible capabilities against the increasing capabilities and numerical strength of the PLAN and PLAAF. The JASDF stands out among modern air forces in that it has traditionally taken the anti-shipping role fairly seriously. The Mitsubishi F-2A and McDonnell Douglas/Boeing F-4EJ Phantom-II fighters are both equipped to launch the Mitsubishi ASM-1 and ASM-2 active radar homing Anti-Ship Missiles (AShMs) and have a doctrinal anti-ship role. However, imports of Russian Surface-to-Air Missile (SAM) systems such as the Almaz-Antey S-300PMU/PMU1/PMU2 have not only given the PRC use of these formidable systems to defend land installations; they have also allowed PRC engineers to reverse engineer many features of the system. 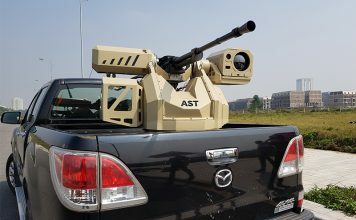 The PRC has combined many of the best features of Russian long range SAM technology with Western technical information stolen on an industrial scale to produce its own indigenous long range SAM systems in the form of the China Precision Machinery Import Export Corporation HQ-9 SAM system series. These include the HHQ-9A/B and HQ-26 for PLAN vessels, which together with rapid advances in Chinese active electronically scanned array radar production for naval vessels, fighters and Airborne Early Warning (AEW) assets, makes getting within AShM launch range of PLAN major surface combatants a very dangerous prospect in the event of hostilities for any aircraft which is not either low-observable or capable of heavy and frequency-agile jamming. Furthermore, whilst the HHQ-9A/B series have inferior capabilities at present to intercept AShMs that fly extremely low for their entire approach and terminal flight phases, the ASM-1 and ASM-2 are higher flying in their approach phase than missiles such as the MBDA Exocet and Saab RBS-15 AShM families and are not stealthy like the Lockheed Martin AGM-158C LRASM (Long Range Anti-Ship Missile). Furthermore, because the F-2A and F-4EJ use indigenous Japanese avionics and mission systems, it is harder for the JASDF to integrate promising foreign missiles onto these aircraft. The new supersonic Mitsubishi XASM-3 is in development for the F-2A but is still some way from service and does not satisfactorily increase launch platform survivability against major surface combatants. As a result, the existing aerial capabilities of the JASDF based on the F-2A and the F-4EJ, and JMSDF in the shape of the Kawasaki P-1 and Lockheed Martin P-3C/D family maritime patrol aircraft are unlikely to be able to provide significant deterrence against major PLAN surface combatants even before the nascent but unmistakably ambitious PLAN aircraft carrier programme becomes a serious operational threat. Given these difficulties in executing the strike and particularly anti-shipping roles which are a core part of the JASDF remit to deter incursions into Japan’s territorial waters, the JASDF has an urgent need for more capable aircraft for this mission. 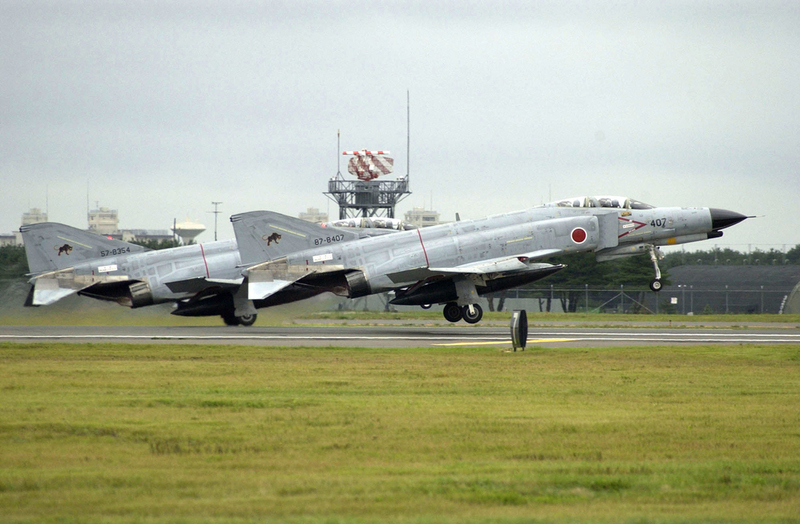 The most immediate priority for the JASDF must be the replacement of its three remaining squadrons of F-4EJ fighters. The F-4 Phantom family was a world beating aircraft in the 1970s and remains a potent, almost fourth generation platform when equipped with modernised radar, electronics and missiles. However, it is outclassed by China’s Sukhoi Su-27 family derivatives in radar performance, kinematics and missile payload. Against the modern air defences which the PRC deploys on its islands, mainland and naval vessels, the F-4EJ presents a huge radar cross section and has limited manoeuvrability for evasion once targeted, meaning it is increasingly obsolete in the strike role. The Lockheed Martin F-35A Lightning-II fighter (see below) has been identified as a replacement for the F-4EJ. However, Japanese procurement funding constraints, as well as the decision to assemble 38 of the 42 currently on order in Japan at Mitsubishi’s facilities mean that the acquisition rate is likely to be limited to a few examples each year at best, and it will take some time to replace all three F-4EJ squadrons. The much higher combined acquisition rate of Chinese fourth generation Chengdu J-10A/B, Shenyang J-11 family, J-15 family and now a trickle of early-production Chengdu J-20A fifth-generation fighters means that Japan’s limited quantity and acquisition rate of F-35As alone is not ever going to be sufficient to keep pace with PLAAF and PLAN fighter modernisation. The JASDF’s second fast jet fleet which also presents challenges is its multirole and primary anti-ship fighter, the Mitsubishi F-2A. Developed at great cost and over more than a decade between 1987 and its introduction into service in 2000, the F-2A is externally similar in appearance to the General Dynamics/Lockheed Martin F-16 fighter family, but with a 25 percent greater wing area, larger control surfaces, engine intake and framed canopy. Internally, the F-2A was a significant advance over the late 1980s F-16 design which it was developed from, incorporating many indigenous Japanese electronic systems including the Japan’s first operational Active Electronically Scanned Array (AESA) radar, the Mitsubishi J/APG-1 X-band (8.5-10.68GHz) system. However, the F-2A was extremely expensive as a result of a limited production run of 94 aircraft. Due to Japan having to pay development costs as well as setting up its own production line, the F-2A was more than four times as expensive as a comparable F-16C/D Block-50/52 fighter which was the latest US standard when the F-2A finally entered service in the year 2000. The F-2A is also much more problematic in terms of integrating non-indigenous advanced payloads due to its heavy use of Japanese electronic systems which were state of the art when designed but are now an expensive and complex challenge in terms of system capacity growth to meet future challenges. Furthermore in the fighter role, the F-2A was an aerodynamic upgrade over the original F-16 family in terms of operational altitude and wing loading, but is still at best on a par with the latest Chinese Sukhoi Su-27 Flanker fighter family derivatives regarding beyond visual range performance and inferior to both the former and the J-10 family during within visual range combat due to the latters’ superior agility and the lack of a helmet-mounted display for the F-2A. The F-2A has some advantages with the latest Mitsubishi J/APG-2 X-band radar and miniature AESA-seeker equipped Mitsubishi AAM-4B active radar homing air to air missiles. 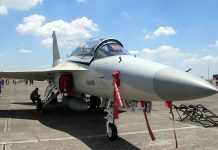 However, it is available in far smaller numbers than the PLAAF can field, will show up at long range on PRC radars due to its lack of modern radar cross section features or latest generation electronic warfare jamming pods, and carries substantially fewer missiles than the Su-27/J-11 family. As a result it is adequate at present but cannot provide any new long term answers to Japan’s increasing air defence challenges. 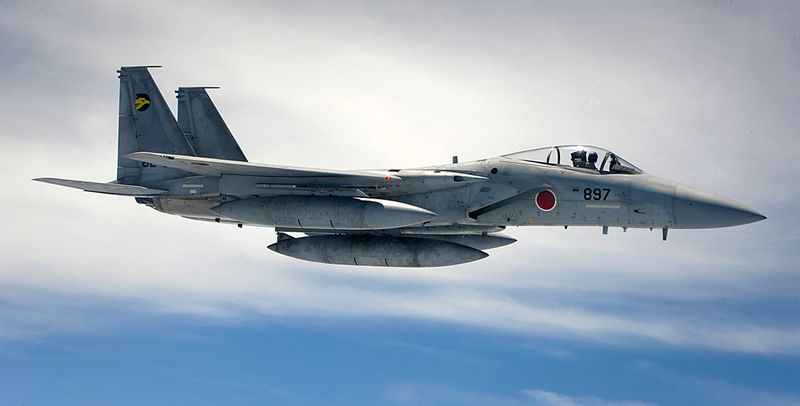 However, the F-2A is not the core of the JASDF air defence mission, that honour falls to Japan’s modernised F-15J which is still at least a match for the PRC’s fourth generation fighters. The venerable but flexible and reliable F-15J design will remain viable as the core of Japan’s air defence capabilities for the next decade in spite of limited numbers of J-20s entering service in China, so long as they can be properly integrated with the small number of F-35As entering service during that period. The F-15J is also an excellent platform to conduct routine air policing scrambles, being fast and possessing a long range, with few radar cross section secrets worth exploiting by PRC and Russian electronic intelligence aircraft during such encounters. Its manoeuvrability in the visual range arena is respectable. Nevertheless, the Japanese standard Raytheon AN/APG-63V1 X-band radar and AAM-4B combination, coupled with the F-15J airframe’s inherent high altitude supersonic performance, makes it a formidable beyond visual range fighter even today. In terms of future viability, advanced fourth generation fighters like the F-15J which are designed around powerful radars, missile loadouts and high performance at altitude work extremely well alongside the F-35 family and the USAF’s Lockheed Martin F-2A2A Raptor fighters. The ability to fly extremely high and extremely fast with a large loadout of AAM-4Bs will make the F-15J indispensable to the nascent Japanese F-35A force as the latter starts to build up over the next decade. The F-35 is a formidable low-observable flying sensor and strike platform, but it carries a limited internal weapons load. The F-35A will, therefore, be significantly dependent on sensor-to-shooter integration with other fighters in any hypothetical clash with the numerically superior PLAAF. On the flip side, the F-35A even in small numbers could get much closer to potential air and ground-based threats than the F-15J force before being detected, and provide the latter with track-quality target information on threats within a large operational area to allow the F-15J/AAM-4B combination to even the odds for the F-35As. 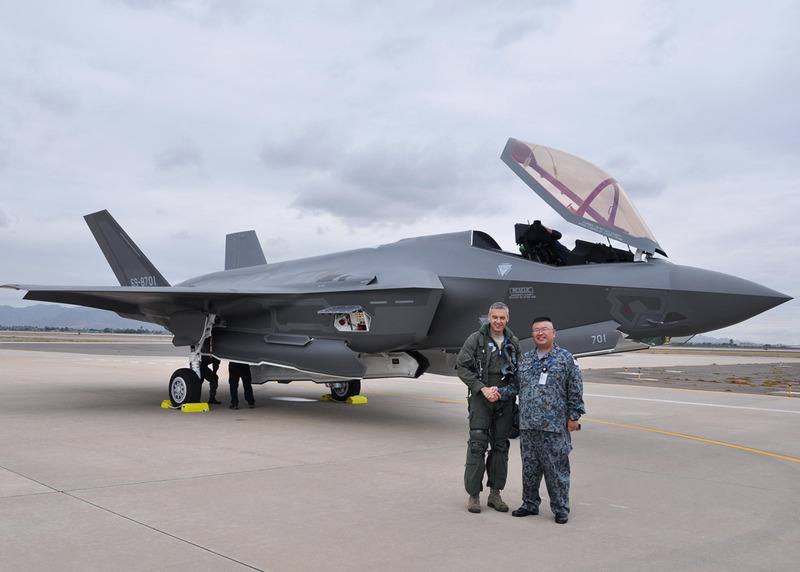 Even coupled with the F-15J force, however, the F-35A is not a perfect fit for the JASDF. In simple terms, the JASDF needs a fighter capable of deterring the PLAAF’s best types with enough technological overmatch to at least partially offset its inevitable numerical disadvantage. This is why Japan was so keen to be allowed to purchase the F-2A2A and why Japan has re-prioritised its own fifth generation technology demonstrator, the Mitsubishi X-2 Shinshin, since the F-2A2A’s production cancellation in 2009. The F-35A will give the JASDF a greatly increased capability against ground targets and ships protected by modern SAM systems, and if tactical datalinks are are properly invested in, can significantly boost the combat capability of the F-15J fleet against large numbers of modern aerial threats. Nevertheless, its limited range on internal fuel and limited missile loadout makes it inefficient in the air defence role except in the comparatively large numbers which Japan is unlikely to be able to afford. 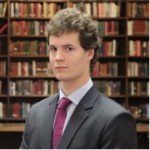 Furthermore, as already discussed, the very heavy scramble rates which have become the ‘new normal’ since 2012 are using up the fatigue lives of the JASDF F-15J fleet much faster than planned which will inevitably result in a need to replace or at least augment this core asset by around the late 2020s. Therefore, Japan has placed its long term fighter hopes in a fighter derivative of the X-2 Shinshin which first flew in April 2016. The ATD-X programme under which the X-2 has been developed aims to produce a sixth generation fighter tentatively called the F-3 in the late 2020s with an advanced low radar cross section, significant internal weapons payload, advanced airframe-embedded AESA radar, thrust vectoring and super-cruise capabilities. It remains to be seen whether Japan can actually produce such a fighter alone given its one percent of gross domestic product defence spending limit and the many other requirements for finite resources in the country’s armed forces. Yet Japan is actively reaching out to potential international partners for cooperation on engines, airframe design and other aspects of the F-3. Whether Japan succeeds in building the first successful non-US air dominance fighter capable of matching or even surpassing the capabilities of the F-2A2A or not will likely have a huge effect on the balance of airpower in the Asia-Pacific in the 2030s and beyond.